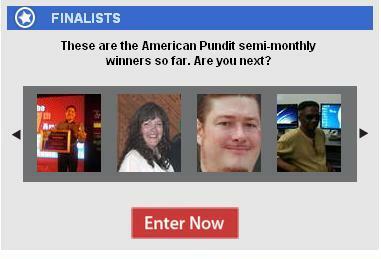 AllVoices.com, an international online citizen journalism platform based in San Francisco, California, has announced today that I am one of the two winners in their ongoing American Pundit Contest. Writers from all over the world can join the competition, which runs until November 5, 2012 (or a day after this year’s United States presidential elections). The other winner is Amee Ellsworth of Bennett, Colorado. AllVoices is seeking “well-informed (and) well-written political reports that relate to the 2012 election” for the competition. Every two weeks, AllVoices also announces specific topics that interested parties may write about. For the first half of June, participants were asked to “write about how America and the world would be different if any of the eight U.S. presidential elections since 1980 had gone the other way” (Carter winning reelection over Reagan in 1980, and so on). “In writing about Reagan’s see-no-evil policy toward U.S.-allied strongmen such as Augusto Pinochet of Chile, Baby Doc Duvalier of Haiti and the Philippines Ferdinand Marcos, Madrona explains how the U.S. commitment to international human rights became a glaring sham under Reagan. My opinion piece “A more democratic world without Ronald Reagan” has won in AllVoices.com’s American Pundit Contest for the month of June. He added that had Carter won a second term, “the whole world will be like the Middle East now.” A commenter named Adrian Holman claimed that the scores of American hostages held in the US embassy in Tehran would still be in Iran if not for Reagan. The citizen journalism website noted that this is only the second time since the competition was launched last January that a non-American writer had won. According to AllVoices, my win gives the competition organizers “a chance to reiterate that while The American Pundit deals with Campaign 2012 in the United States, writers from all over the globe are welcome to participate.” Looking at the roster of past winners, I am fairly certain about being the only winner from Asia so far. Anyone can report news on AllVoices through its website or via SMS. The idea behind AllVoices first came about in 2005 during the aftermath of a strong earthquake in Pakitan, the native country of its founder Amra Tareen. Speaking to About.com’s Tony Rogers, Tareen said she wanted to share her impressions of the disaster to the whole world but she has no platform to do so. According to Forbes.com, AllVoices has 300,000 site-contributors from 161 countries worldwide – as of 2010! Evidently, AllVoices, a site not affiliated with any mainstream media outlet, has further upped the ante of citizen journalism worldwide. PS: This is the first time I’ve won in an international competition, and oh boy, being described as a “writer from the Philippines” gave me chills! This entry was posted on Saturday, June 23rd, 2012 at 3:19 am	and tagged with AllVoices American Pundit Contest, Amra Tareen, Jimmy Carter, mark pere madrona, Ronald Reagan and posted in history, journalism, personal matters, philippines, politics. You can follow any responses to this entry through the RSS 2.0 feed. Thanks for posting about our contest and congrats for winning this round!